Aerts and Tarca (2010) study attributes of performance explanations in management commentary reports provided by 172 companies from five industries in the USA, Canada, the UK and Australia. They report that, compared to their counterparts in the UK and Australia, companies from the USA and Canada are generally less assertive and less defensive in explicit causal framing of accounting outcomes. They are also more extensive and formal in their explanations, relying more heavily on accounting-technical language in explaining performance outcomes. We investigate whether these differential attributional properties have economic relevance by considering their relationship with analyst forecast dispersion. Using a factor analysis based on firm-level characteristics of explanatory statements for 158 companies included in the above study, we find that defensiveness and extensiveness of performance explanations are negatively associated with analyst forecast dispersion, while assertiveness and formality are not. Our results suggest that analysts benefit from more detailed explanations and that they pick up defensive explanations while possibly disregarding more assertive explanations. Not surprisingly, the use of more technical-accounting explanations does not serve to reduce dispersion in forecasts. Our study brings together two strands of literature, being studies of explanatory patterns in narrative reports and studies investigating usefulness of narrative reports for analysts. 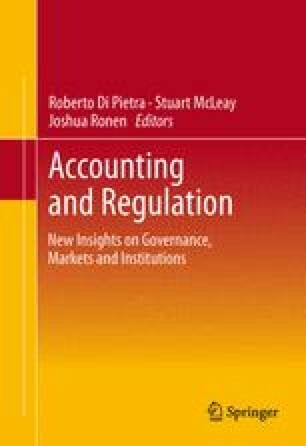 This chapter includes the paper originally titled “The effect of Institutional Setting on Attributional Content in Management Commentary Reports” and discussed at the Fourth International Workshop on Accounting and Regulation in 2007. We thank seminar participants at the European Accounting Association Conference Lisbon 2007, the EIASM Accounting Regulation Conference Siena 2007, the AAA International Accounting Section and IAAER Joint 2008 Midyear Conference, the University of Glasgow and the University of Queensland for their helpful comments on the material in this article and the related study Aerts and Tarca (2010). We acknowledge the financial support of the UWA Business School and of the National Bank of Belgium. We thank the following research associates for their assistance: Serene Seah, Morris Eggleston, Pirya Altraide, Jamille Payne, Hui Li Siow, Eric Vermuyten and Christophe Nauts. An attribution statement: One or more sentences (or part thereof) in which an outcome or effect (relating to a firm’s financial performance, i.e. revenue, expense or net income/earnings/profit item) is linked to one or more antecedents for that outcome. Each attribution statement was coded on dimensions A01–A05 for the outcome/effect phrase and B10–B15 for each antecedent phrase. The cost of merchandise sold decreased in 2003 compared to 2002 [effect] reflecting lower spending on goods and services due to lower sales [antecedent (a) technical-accounting] as well as favourable procurement conditions [antecedent (b) causal]. Foreign exchange losses decreased in the year [effect] through better management of the consolidated entity affairs [antecedent—causal]. The company’s hog production operations were negatively impacted in 2003 as a result of the sharp rise in the Canadian dollar [antecedent—causal] which immediately reduced producer revenues [effect]. Maple Leaf Foods, 2003 p. 29 (Canadian Food producer). We are continuing to realise gains in our primary margin [effect] as a result of actions to increase overseas production and consolidate our supply base [antecedent—causal]. The outsourcing of the liquid sorbitol production at Atlas Point was completed this year [antecedent—causal]. These changes are expected to yield a profit improvement next year [effect]. Associated British Foods, 2003, p. 20 (UK Food producer). During fiscal 2003 … lower depreciation expense [antecedent: internal—technical-accounting] contributed to improvement in gross profit and margin [effect]. Other income increased to $3,350,000 in 2003 from $2,285,000 in 2002 [effect] primarily as a result of $932,000 improvement in equity in net earning of affiliates [antecedent: internal—technical-accounting]. Securities and Exchange Commission (SEC). (2004). Summary by the division of corporation finance of significant issues addressed in the review of the periodic reports of the fortune 500 companies. Available at http://www.sec.gov/divisions/corpfin/fortune500rep.htm.